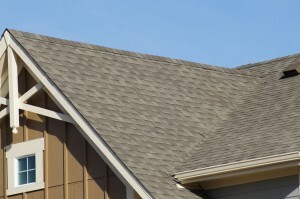 The gutters on the eave of your roof are designed to collect the water from the roof and direct it to a proper location. The downspouts connected to the gutter drain the water away from your home. Have you ever cleaned the gutters out? Many homeowners do not think about that until they have a water issue in their basement or crawlspace. If you have trees around or near your home, you need to check the gutters as they may have an accumulation of leaves and debris. That debris slows the drainage and can clog the gutter and the downspout. Not properly draining water away from your foundation can cause damage. You can find a gutter scoop at the hardware or home improvement store that makes the cleaning easier. All you need is a ladder, bucket and the gutter scoop to clean them out. Most handyman services can also do it for you. Depending on your home, and your ability to climb a ladder, you can do this yourself. Be safe on your ladder. If you are using a step ladder, NEVER stand on the top step. If you are using an extension ladder, be sure it is at the proper angle, resting solid at the base and the top and extended three feet above the edge of the roof. You should perform this maintenance annually at a minimum. I do mine in the fall after most of the leaves have fallen and again in the spring to get those last few leaves from the fall. After cleaning, many times I will get the hose and wash the gutter and downspout out. 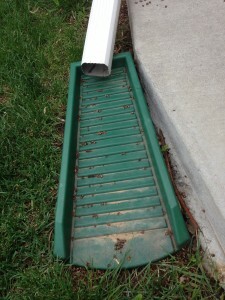 You would be amazed at how much dirt accumulates in the bottom of the gutter. Now for the downspouts. Be sure they are securely connected to the gutter. I see people’s homes where the downspout have come loose and are not connected so the water never makes it into the downspout. 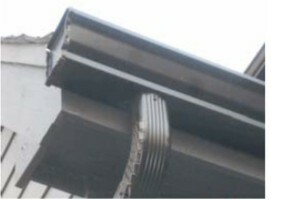 The downspout should be secured to the wall of the house and have an elbow at the bottom. Connected to the bottom elbow should be another length of downspout, the leader. That piece should be 3 to 5 feet long to get the water away from the foundation. Where the downspout ends, there should be a drain block for the water to land on. The drain block helps prevent erosion. See photo below. Also check where the downspout drains in your yard. Is your yard properly sloped to allow the water to drain away? As homes age, the homeowners and the landscaping can change the elevations and create a back slope towards the foundation. If you have that condition, there is the potential for problems with a heavy rain.